Ian Boucher has written a comprehensive article in What Culture taking on the issue of why Marvel Studios fans don’t like John Carter. I won’t steal his thunder by going into too much detail here — it’s worth reading the entire article. For example, he explores how the much criticized promotion failed to do something that it hasn’t really been criticized for, and that is — failing to convey anything about the “big picture” that would be experience dover the course of the entire projected series of films. Of course Disney didn’t want to do this because it didn’t want to create expectations in that regard — but Boucher writes interestingly about the difference between going to see a Marvel film with expectations in this regard, and the murky sense of what the John Carter big picture was. He also takes on curious dimensons such as the uninspiring “poses” that John Carter given in posters and artwork; as well as the generally different state of mind of a Marvel-indoctrinated potential viewer, and how that state of mind was so different for John Carter — and how all of this amounted to the idea of John Carter failing to jell in the mind of Marvel fans, who could have been a good audience for John Carter had the promotion resonated for them. The critique is not limited to the promotion — it also includes some observations about the film itself, which Boucher generally liked but which had elements that he feels predictably failed to resonate with Marvel-indoctrinated fans. Hey Mike, thanks, I appreciate that. You of course have the right to feel how you want about anything, and I understand that some articles can grind our gears, but I appreciate your further thoughts, and I’m of course glad you changed your mind. Out of curiosity, did the article seem irritating because you thought I was being serious or because I seemed to be putting down others? My focus could definitely have been better, as I was trying to do neither; I just wanted be satirical to make people laugh while thinking about the issue. Oh brother. Yeah Mike the cave was important in that it made Carter a selfish jerk who didn’t care for anyone, just a cave that really bares little on the actual plot concerning Dejah, the Tharks and the fate of Barsoom. And considering Stanton changed how Carter goes to Barsoom with the stupid medallion the cave ultimately served no real story telling purpose compared to the book. Then again Burroughs didn’t make Carter selfish of yes whiny. Try taking off the Rose colored Stanton glasses and you’ll notice Mike. Or maybe read the book and see why this film was a botch from day one. Sorry Ian after reading all of the comments I take back my previous comment. I think I was just steaming about some of the things you said, but I can see now you were writing about what you thought other people were feeling. It seems to me you whine more about that cave of gold than The Warlord does. He mentions it what? three times? If that is alot to you then I don’t know what to say. I think the reason he mentions it a couple of times is because it’s a very important part of the plot. It fuels all of the story on earth. Without it he wouldn’t have been able to do the things he did. That writer is an idiot. Ian, I support getting another John Carter of Mars movie. But not another Andrew Stanton-Disney John Carter movie. Stanton’s “perception” of the book was that he had no respect for them and that was shown in this film. Also the idea of supporting original storytelling that moves the reader or viewer I am all for. That’s why I’m a fan of Burroughs. But Stanton failed there as shown by Carter’s pointless back story and dead family, not to mention his shape shifting Sith Lord clones. Burroughs was more imaginative than that and that I do believe needs to be supported. And if another director can capture that then I’ll be behind that a 100 percent. But supporting Stanton’s storytelling and his mishandling of John Carter? Can’t do it. And we won’t get better John Carter story angles either without voicing some kind of support. Even if we don’t like it, there are other constructive ways to approach our reactions. I didn’t mind the optimism of Thor, the lack of powers, or the basic parameters of the script overall. I just felt like Thor’s arc could have been much more organically achieved. No pun intended just now with the eggs. I also felt like many of the characters were stale. I think Tom Hiddleston and Chris Hemsworth definitely got their characters, but without the right script, it’s not good to me. And yes, people generally expect more self-contained things each time. I like how John Carter is more stretched out, but I can see how it was too much. But we should still be supportive of stories trying to do different things. And you actually pointed out many details about characterization in John Carter that I would have pointed out. As far as empathy, I would argue that Carter shows his empathy and honor toward Sab Than just like in the books, by offering him an honorable way out after Sab Than has surrendered. There was no way Sab Than would have listened without being incapacitated. And if he lived, I’m sure he would have double-crossed Carter, just like the best of his villains in the books. There’s also the moment with Sola at the shore, and with Tars Tarkas when John perceives that they’re related. I think you’re right. I was happy with many aspects of the movie, but I think there were some things that could have been better. Although I do think it’s a for the most part very well-updated companion piece. But it’s not definitive of course. I really, really want the sequel, because they already started introducing those themes in the first movie so compellingly (to me), but I’d also welcome other interpretations in the future. I’ll still always feel sad about this movie though. I hope you don’t think that I think Stanton and Pixar are infallible, and I also hope you don’t think that way of other fans. Some people are just fans and defend what they like. And this website proves there is an audience for the movie. I think there is a larger one out there too, but the opportunity to build it in theaters was missed. And the movie, like Michael said, while certainly not perfect, is respectful of the filmmakers’ perception(s) of the books. Everyone sees things differently, as I think John Carter is more fun and you think Thor is more fun, for a variety of reasons within our tastes. But the point of my article is that we should be supportive of experiments in storytelling. Not everything soars or plays to our tastes, but if the story is coming from a genuine place, we won’t get more variety in the marketplace by hammering such attempts into the ground. Again no pun intended with the hammer. With Powell, you don’t have to feel it, you SEE it, when Carter turns back to rescue him from the Indians. Even Powell was surprised. Poor Powell, he had the most horrible death of all! Same for Woola when Carter could have just escaped and let him get beaten to death. The empathy for Sola you see on Carter’s face when she is being whipped. And for Dejah, well, he gives his life for her. So it’s more complicated than that. Towards Sab Than, indeed, no empathy at all, but it’s even worse in the book, where his only reason to die (off-screen!) is just because he proposed to Dejah and she said yes! I’ll try not to be “ham-fisted.” But no promises. I don’t see the movie Carter having that much empathy for anyone. Powell? He tells him to kiss his rear and that- despite women and children being killed-that he didn’t care. A funny response for a grieving widower. Woola? Not much there compared to the book. With Sola none. He was forced to take her, no real empathy. And Dejah? We have debated that one, with Carter pushing her off her ride and his back sliding. All of this overshadowed any empathy Carter supposedly had and made him unlikable and a jerk. Also what empathy did Carter have for Sab? He cut off his arm for Pete’s sake. Granted Sab doesn’t bleed to death after Carter went all Obi-Wan on him but it wasn’t like Carter had any empathy for him. He was the bad-and badly written-guy so there was none necessary. Also I get that this choice was made by the infallible Andrew and endorsed by his Pixar buddies but the box office and that low word of mouth seems to show it didn’t reach their supposed “target audience” as you said. That’s why I brought up the wom before as proof that Stanton’s choices didn’t make the film more appealing to it seems the larger audience that goes to movies, including Marvel films. Although you can argue what audience Stanton was going after since he had no respect for ERB fans, scifi fans or people who were not fans of Kitsch’s pecs. As for Thor, Pacalahad actually hit a lot of why I liked it. It is not perfect but was more fun than John Carter. That and Branagh and company didn’t bad mouth the source as much as Stanton and his lackeys did. That counts. The movie version of Carter did want to belong. He was miserable and only focused on the cave of gold because he thought there was nothing else real in life. He pushed people away because of his personal issues, but couldn’t pretend to be something else when it counted. He shows empathy throughout the movie, for Powell, Woola, Sola, Dejah, and Sab Than. Like in the books, just in a different way. MCR, I know you’ll want to fire back at this …. but I want to point something out. Look at the ease with which Ian — who is probably closer to Stanton’s target moviegoer than any of us — describes Carter in a much more charitable way than you do, but Stanton’s Carter is still fully recognizable. I really think that Ian represents the kind of viewer that Stanton and the whole Pixar braintrust had in mind — and remember, the braintrust, collectively and individually, didn’t have a problem with the character of John Carter. Stanton was speaking in a character language that the target audience understood and they got a lot more from it than some of the rest of us did. Frankly I was pleasantly surprised by Thor. If I had a say about the story I would have gone the Don Blake way though, but I thought it worked the way it was written. I guess the key is that depriving Thor of his power reveals the “real” Thor, namely a decent and humble guy, yes, that cooks eggs. And why not? The key of Marvel movies in general is “optismism” (which is perhaps why the least successful was The Incredible Hulk)l . I bought the romance with Jane Foster more than I bought initially the romance of John Carter with Dejah Thoris. Andrew Stanton chose to hide the true emotions of his characters, he hides the heroic side of John Carter behind grumpiness, and the love story behind deception on both sides. That’s perhaps why John Carter has more to offer, since you really have to see it more than once to pick all the clues, but Stanton’s narration doesn’t help the casual viewer. He trusts the audience to understand the under layer of the story. And he chose to build his movie as the first chapter of a planned trilogy, and I think that may hurt the viewing experience more than the Marvel way of doing things, which is mostly to give a self-contained movie each time. And at the end of the day, different people like different things anyway. As far as word of mouth, I meant that more people who saw John Carter like it rather than dislike it. And I think the DVD sales were much better than anticipated. But because of the very, very poor awareness of John Carter, nothing could have saved it. If Titanic had bad press, it’s more of a mainstream movie so it could have circulated better via word of mouth. And there are plenty of good movies that, for a variety of reasons, don’t get the recognition they deserve. Some, like Vertigo or Blade Runner, don’t get initial recognition, but then become very popular years later. Others, which are more for niche markets and fall through the cracks of the mainstream, gather cult followings as their audiences are found gradually over time, even getting sequels years later. And there are plenty of bad movies that get tons of good attention. Some people will see a movie just because they hear about it so much and there’s nothing else to see, regardless of the reviews. Others don’t care about entertainment level at all and just want to watch something. So box office and audience size do not completely represent quality. I’m really surprised that you’re this passionate and detailed in your arguments toward John Carter but don’t acknowledge any flaws in Thor — not the character, but that particular screenplay. It’s a really undernourished screenplay. MCR, I’ll take a whack at that one. You’re absolutely right that JC just didn’t have word of mouth that compares with Cameron in the case of both Titanic and Avatar. But there are some aspects of the JC word of mouth that are interesting — in particular the intensity with which many fans like the film is literally off the charts…. but overall, not so much. One way of measuring word of mouth is to look at how much the opening weekend is, as a share of the total box office gross. Typically, the figure is around 35% for bit blockbuster movies; that is, the opening weekend figure ends up being 35% of the total. Coming in to John Carter, Stanton’s average was 24% — which is pretty good. In other words, the lower the opening weekend percentage of the total, the better the word of mouth. Stanton had actually managed 18% for Nemo, and 28% for Wall-E (I’m doing this from memory so I might be a point or two off, but that’s all). Now …Titanic and Avatar are just in a league all their own. Both are in the 10 to 15% range, meaning the opening weekend ended up being, phenomenally, only 10%-15% of the final total. Now THAT is word of mouth. My point to you, though, is that while JC didn’t rise to the heady heights of Titanic or Avatar in terms of word of mouth, neither did any other tentpole movie in the last fifteen years. Why should John Carter be held to that standard? There are plenty of movies that get the a good start, have the usual dropoffs, end up with opening weekeend being 35% of the total, and get a sequel. Why? Because in the case of those films, the marketing was adequate and the opening weekend number was big enough so that, with the standard dropoff, enough money was still made to make a sequel. Had John Carter been made with a sane budget and decent marketing, then the film itself had good enough word of mouth to succeed. It just didn’t have good enough word of mouth to overcome both the bad marketing and the high budget. Ok I’m going have to disagree there. Carter in the books did feel out of place because he had no found what he was looking for, which was a place to belong. The movie version didn’t want to belong, he just wanted his cave of gold and whined about it a lot, to the point he became unlikable and a jerk. Also the novel Carter showed empathy for others that the movie version didn’t with his “get lost” attitude he showed towards Dejah and others. As for people being happy with it maybe you can answer this. Why then if the word of mouth was so good did it flop? The constant defense of bad marketing and negative press didn’t cause Titanic to bomb so it had to be word of mouth. If John Carter was so good wouldn’t have done better? And yeah I did find the development of Thor better. Maybe it was because Chris Hemworth had more charisma then Taylor Kitsch maybe it was a better movie. It was more fun than Mopey Carter was. Overall, I think the filmmakers really hit than atmosphere of alienation well. They used the damaged hero idea to support that theme as opposed to just making him damaged to get a rise out of the audience. It plays into his overall feeling of alienation and being at a dead end in his life and I think what the filmmakers wanted to do works fine in the movie. It’s not necessarily the greatest thing in the world but it’s not awful by any means. Yeah, good point. 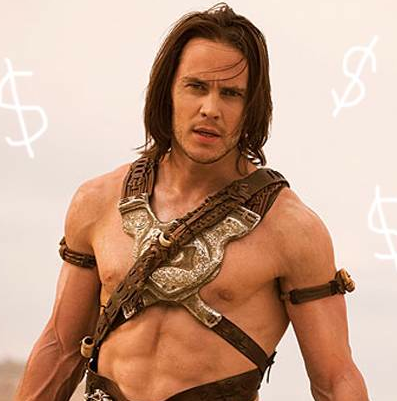 Tragically, John Carter was invented before spandex, so he didn’t have a chance. There’s no way he could be so aerodynamic without spandex. But if his shoulder pad turns out to be a symbiote in the sequel, that might be a step in the right direction. I actually did read the first three books and pointed out in the conclusion of my article that John Carter’s background in the books is different than in the movie. I think the filmmakers could have adapted the story in a number of different ways. They chose to do what they did, and obviously took the damaged hero route. But I think the movie works well as a companion piece to the books because it conveys the same core spirit, at least to me, of Carter feeling out of place on his own planet. Overall, he is very much the John Carter from the books, and the tone is very much Burroughs in many ways and supports what they wanted to do for this particular adaptation. And by the end Carter was all ready for The Gods of Mars. I was following him almost every step of the way. And an adaptation does not need to be literal. And I think there has been more good word of mouth response than bad. And even if you don’t like the angle they took with John Carter, surely you don’t think the development in Thor was better? I think the real reason John Carter didn’t click with Marvel fans is that he didn’t wear Spandex. I get the feeling Ian you have never read the books by Edgar Rice Burroughs. The character “development” Andrew Stanton created for this film bears no resemblance to the character Burroughs created. Instead it was a bad ripoff of The Outlaw Josey Wales and Stanton’s misguided belief that audiences only like “damaged goods” heroes. Obviously the poor critical and word of mouth response proved otherwise and failed to make that many people happy as you claim. I suggest reading the books and the see if you still believe this “development” was necessary. Thanks a lot Rick Barry — your thoughts on the essay’s tone were exactly what I was going for! I’m glad it resonated with you. And Michael: Yeah, Marvel and Disney could have done a lot more to help. Marvel did do some things, but it wasn’t nearly distinct enough from what I could tell. And about MCR’s thoughts — I wouldn’t have had John Carter’s development be any shorter. I truly believe the movie was meant to be part of a true trilogy, and the filmmakers wanted to give their characters time to get to their hearts — and I think the filmmakers made a lot of people happy, although you can never please everyone completely. But even though I find the development and the movie to be very, very moving, I still do think both needed some work. Rick Barry — I agree. This is a great bit of insight into the mindset of what could have/should have been a key market for the movie. Disney could have understood this and found a way to position the film better for this group — but the zombie promotional campaign didn’t get it done. The sad part is that John Carter was a Marvel hero in the 70’s and Marvel again was putting out JC comics as part of the run-up. It would have taken very little effort for Disney, who after all OWNS MARVEL, to get Marvel to engage with the film and give it a boost via some kind of cross promotion, cross-branding. Remember Avengers was coming along 9 weeks after John Carter …. how hard would it have been to get some shoutouts from Avenger characters to John Carter as the original, the grandaddy, whatever. Never mind that DCs Superman was the first JC-inspired superhero — all superheroes can trace their lineage to him……missed opportunities. MCR …hey, c’mon…..be nice. You and Ian should be agreeing with each other — after all you’re making sort of the same point, that JC’s long road to becoming JC of Mars was just too damned long. He calls it development and most people would agree……you can chart all the beats with John Carter from his arrival to his tossing the medallion and if you’re actually paying attention with an open mind and not just fuming at the fact that it ain’t what you want to see, then you can’t help but acknowledge that there is “development” …… I believe you might refer to it as “useless development” and that would be fine. But development it is. “John Carter may be cool in theory, and the movie may have been adapted from somebody else’s work instead of an original script, and the book series may have been near-plagiarized in countless ways over the 20th and 21st centuries to influence almost everything that I like, but I didn’t see him on TV when I was a kid. No cartoons, no live action shows, no toys, no trading cards, no bubble gum, no toothbrushes, no macaroni, and let’s not forget, the greatest travesty in a long line of travesties, no John Carter underwear to put over my non-existent John Carter pajamas. He makes several great observations, but that’s the big one Disney’s marketing never effectively addressed. And, of course, a week or so after the film’s release Disney’s notorious press release kneecapped it. Well done, Ian Boucher. And Michael, thanks for finding this. Also, I’d like to thank Michael Sellers very much for posting my article. Not only am I thrilled that he finds it interesting, and interesting enough to share like this, but I also think his points further expand and develop what I wrote. Which is exactly what I had hoped for when I wrote it — discussion and debates to make sense of this situation so that things in the film industry can maybe improve bit by bit. Because our perception of things makes a difference. I’m actually a big John Carter fan and I think it’s a real shame that the movie didn’t get any steam. But I don’t think the movie is perfect by any means, and it’s not my favorite movie ever. I think I give credit where it’s due in the article. Even as I state my opinion, I try to be objective and take into consideration how others would see a movie, because if I’m writing about the effect of a film on society I can’t ignore mass opinion or actual events that occur from those opinions. My focus in the article could have been better honed. It is meant to mostly be satirical to get people thinking about why they like what they like, to help future movies like John Carter, which try to do good things for storytelling, and keep the viewing market diverse. I LOVE the eggs comment!!!!! That was awesome. To those who don’t haven’t read the whole article, you should. I’m actually a Marvel fan as well. This article is just meant to make us laugh at the industry and ourselves as we think. And I think John Carter does develop as a character. It’s done very subtly but kind of so much so that it can kind of go unnoticed. It’s very profound when it hits you though. As a devotee of ERB I felt the studio could have promoted the fact the film was an adaptation of master story teller ERB. As an author myself, inspired by ERB I was dead keen to see JC and for once felt that someone had at last done justice to one of ERB’s stories. Can’t wait for the sequel! Michael: Thank you for sharing this article. Mr. Boucher does make some valid points with tongue planted firmly in cheek. I have met quite a number of the “Marvel zombies,” and they feel that if “the House of Ideas” did not create it is not worth their time and effort to read it or watch it. They feel that the Marvel creations were created in a vacuum ex nihilo from the minds of those at Marvel. I will cite one example; I was talking to a Marvel fan who referred to Green Arrow as DC’s answer to Hawkeye despite Green Arrow predating Hawkeye by over 20 years. They do not acknowledge any outside influence on the creation of their favorite characters, and they do cringe at the mention of Superman. If they do not want to acknowledge the influence of Superman on all subsequent super heroes, they will definitely not want to acknowledge those characters that influenced the teens from Cleveland to create Superman, namely John Carter and Tarzan. Again, thank you for sharing this article. Sorry but was this guy for real? Yeah sure it does. Between the whining, acting like a jerk and moaning over his cave and his dead crispy family (original or extra) there was no “character arc” in this film. Nothing except Stanton failing at it. Beyond that it seems this guy just hates Marvel movies and is another Stanton worshipper P’OD that his God’s movie tanked. Of course I could be wrong since I only got two pages in and just gave up.